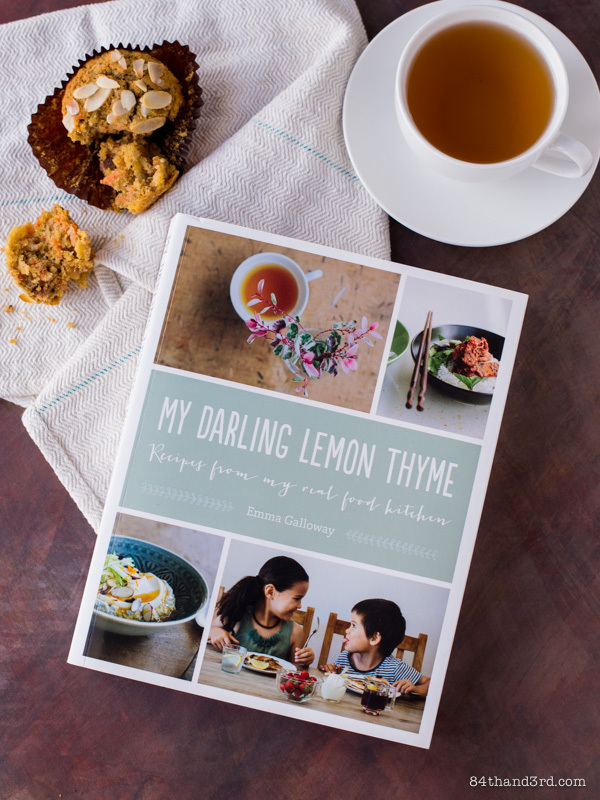 Gluten-free, mostly dairy-free, and wholly vegetarian — but don’t think for a moment that any recipe in My Darling Lemon Thyme – Recipes from my real food kitchen by Emma Galloway is anything less than mouthwatering. I’ve known Emma online for a while, but last year I had to pleasure to meet her in person and have a lovely chat over lunch. 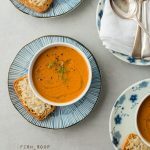 A soft-spoken, New Zealand ex-pat, she is amazingly passionate about food and it comes through in every word, recipe and photo on her blog and in her book. 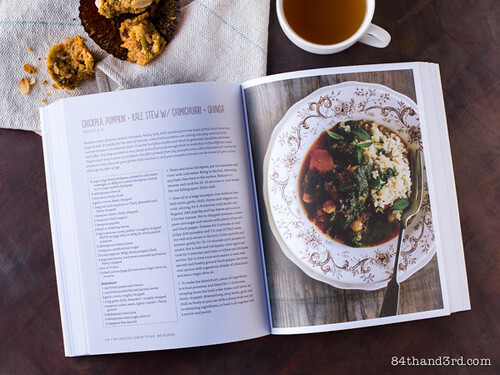 What is fascinating to me is not only her seriously unprocessed real-food upbringing or her training as a professional chef, but her solid dedication to publishing a cookbook. Emma’s success story is underpinned by a conscious decision to develop a book proposal and send it around until someone bit — and thank goodness they did! 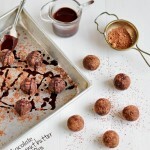 The recipes in Emma’s first book are filled with warmth and family and love. They are driven by her time spent in commercial kitchens and living with food sensitivities — and a serious dedication to dessert and bread. It’s been a while since I’ve turned corners on pages of a cookbook but I must admit I’ve creased a fair few in My Darling Lemon Thyme. The book begins with a comprehensive pantry section including gluten-free flours, natural sweeteners, good fats and a number of other staple ingredients before diving headfirst into morning breakfast rituals aptly labeled Rise & Shine. Emma then continues with Small Plates | Sweet Tooth | Big Plates | Drinks & Frozen Goodness | Sweetness and a slightly ambiguous Etc. which hides — amongst other things — pastry crusts, flatbreads and a simply stunning looking gluten-free sourdough. MDLT is a book you’ll want to curl up with. A story of food written by a busy mum with years of training in professional kitchens, it is best read while sipping a cup of tea and nibbling a Carrot, Apple and Ginger Muffin. You’ll chuckle at Emma’s retelling of being the girl at school that showed up with hippy food and laugh as you realise there are two chapters of sweet treats cheekily tucked between savoury, easy to prepare meals. You’ll be flipping pages and turning-down corners and then all of a sudden you’ll stop in your tracks as you stumble on her Gluten-Free (nut-free, no-gum) Pizza Crust innocently hanging out in the middle of the Big Plates section. The pizza crust is the first thing I made (then made it a second and a third time), and that recipe alone is worth buying this book. Lucky for you I have a copy to give away. Giveaway open until 11.59pm Friday 1 August (Sydney time) to persons with Australian mailing addresses only. Winner will be selected based on the best comment about something your family cooked growing up that has stuck with you as an adult. Winner will be notified via the email address linked to their entry. Now go have a muffin. Carrot cake is easily one of my favourite cakes. 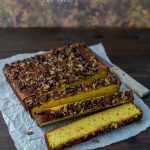 Emma’s version, with healthy fats, very little sweetener and plenty of spice, is a fabulous treat any time of day. 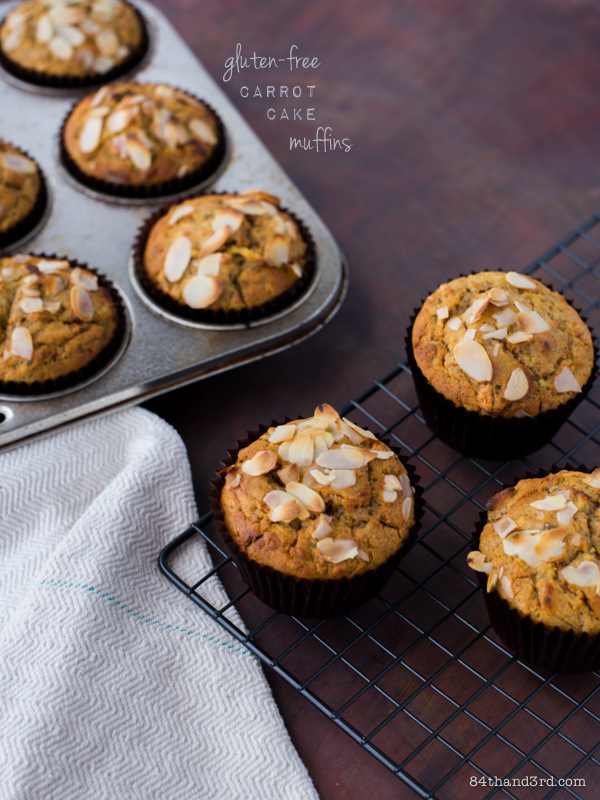 I never need an excuse to eat cake for breakfast but if I did, these muffins would be the answer || Barely adapted from My Darling Lemon Thyme – the book. Preheat oven to 180°C (350°F). Line 10 holes of a muffin tin with paper cups. In a medium bowl, whisk dry ingredients to combine. In a large jug, use a fork to whisk oil, sweetener, vanilla, eggs and ginger until smooth. Stir dried fruit, grated apple and carrot into the oil mixture. Add wet ingredients to dry and stir until just combined. 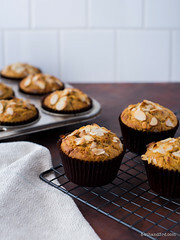 Divide evenly into the lined muffin cups and sprinkle tops with sliced almonds. 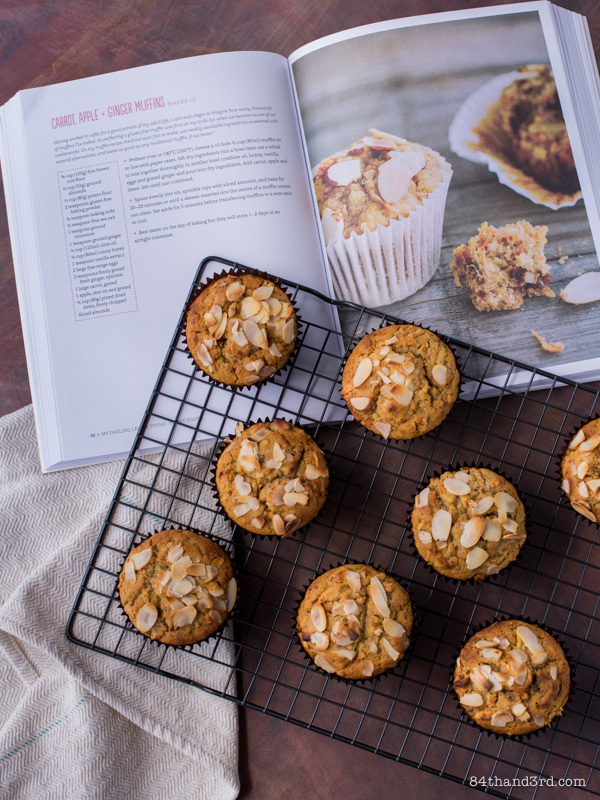 Bake 20 – 22 mins until a toothpick inserted into the centre of a muffin comes out clean. Cool in pan 5 mins then turn out onto rack to cool completely. I use a quarter cup ice cream scoop to divide pretty much any kind of batter into muffin/cupcake tins. Thank you to Emma Galloway and Harper Collins Australia for the preview and giveaway copies. This post is not sponsored, I simply love the book, want to support a fellow blogger and thought that a lucky reader may like a copy too. Mum’s DF/GF apple rhubarb crumble. Growing up my mother always made a vegetarian lasagne from our garden, with layers of pumpkin, zucchini and sweet potato instead of pasta, it was just amazing! I make it for my own family now and it’s just as popular . brings me a ton of memories..
Just a general love of food really! Putting your heart & soul into food prepared for celebrations & special occassions. The dish I most remember is “Chinese Chicken” made with honey & lemon. It has become a family cliche, but everyone loves it! Oaty pancakes. Alison.Holst recipe, one of the first Ilearnt. A great snack for teenagers or a lazy weekend breakfast! Something my family cooked that has stuck with me is lentil burgers and vegetarian food!Mum was into whole foods and was was referred to at the time as hippy food so we ate mostly vegetarian meals, but unlike some people who had a bad experience with vegetarian food growing up, mine was amazing! Mum always managed to make the meals so flavoursome and enjoyable to eat! (Unlike some horror stories I hear from my friends of their experiences with dry tasteless lentils haha. Its what inspired me to continue eating vegetarian food when I got older&moved out of home, and to become adventurous in the kitchen trying recipes she’d brought me up on as well as starting to create my own. 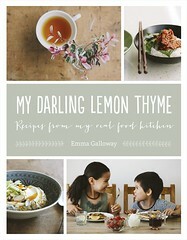 I would absolutely LOVE a copy of My Darling Lemon Thyme, it’s exactly the kind of food I love to eat! I’ve been dying to get a copy!! I think the thing that most sticks with me from my Mum’s cooking is her pastry. She was English and she never measured anything, just chucked it into the bowl and away she went. Her apple pies were stunning, grated apple instead of stewed or chopped and a lovely thick shortcrust pastry and a sprinkling of sugar over the top. Always eaten while warm with custard and the next day, if there was any left, straight out of the fridge. I so wish I had learnt how to make it from her, I’ve tried to replicate it and nothing comes close.. So miss my Mum and Dad (they were married for 52 years and died 5 weeks apart) and her pastry. Scotched eggs were my favourite, but now I can’t eat eggs! Apple crumble with chunky oat crumble! Yum! Great big delicious banana cakes, baked in a large roasting pan to feed the masses! Wish I lived in Australia. The dish that has stayed with me is thick pea and ham soup. I always loved it and it is the comfort food i love in winter. One of my very favourites from growing up was mum’s delicious DATE LOAF! 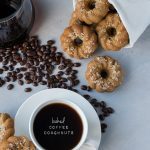 It was baked in a recycled tin that the ends had been removed from and lined with baking paper – so the round shape was pretty magical as well as the flavour. The first thing my mum ever knew how to cook was Spaghetti Bolognese – and I can never bring myself to eat anyone else’s. I’m not sure what she does that makes it taste so good, but I now have very strong opinions on how bolognese should look and taste! That’s a tough one, because I grew up with a lot of food heavy in dairy and gluten, two things that I try/need to avoid now. I would say crumble though (apple or rhubarb), because it’s fairly easy to make a gluten free crust and coconut cream is a great alternative to dairy cream! a really awesome vegetarian chili non carne – scrumptious! Freshly caught snapper. One summer my Dad went fishing so often we actually got tired of eating it. Hard to imagine these days now that I live away from them and don’t have access to freshly caught fish!! I come from a large Italian family and every year the women would all gather at my Great Nonna’s to make passata. All the women would bring the fresh tomatoes they had grown in their home gardens. The tomatoes were always so plump, juicy and sweet that it made sense to call them a fruit. The air would be filled with a slightly acidic sweetness, our hands stained and sticky, and the backyard filled with enthusiastic voices. The crushed tomatoes would be bottled with fresh basil and enough was always made to feed each household for the next year. If that wasn’t already good enough, my Nonna would keep some of the fresh passata aside to make a huge pot of pasta to feed us all. Her ‘sauce day’ recipe included lovingly reared fresh garlic, onion, oregano, basil,passata, pepper, salt and some home cured black olives. I have never known a pasta sauce so light, flavoursome, fresh and aromatic as this. No sauce will ever taste so good as this shared with love, laughter and stickyness! As a kid, my mum always cooked Polish cabbage. We would help cut the cabbage, open the sauerkraut and chop up the meat. It always attracted every fly within 10km so we’d have to lock up the house. It is slow cooked so it took all day but was well worth the wait!! One thing that sticks in my mind from childhood is going blackberry picking optimistically with buckets, so my dear late dad could make his legendary blackberry pies. One thing that really sticks in my mind about my mum’s cooking was the curry – mince and apple and sultanas and Keen’s curry. And the curried sausages, with of course the Keen’s curry. She was impressed the first time she tried an Indian curry paste! I am sure my mother made many things but the things that stick in my mind are rabbit stew (we had to take a half hour bus ride then a ten minute train ride to buy the rabbit), pilaff (my father learned to eat it in Singapore and Sumatra during the war), lamb chops and roasts (we bought a side of lamb a week for the family of 5) with vegetables and “Eggs a la Mummy” – fritters made with left over vegetables and very popular on Sunday nights. Nothing was ever wasted. Almost forgot the plums bottled from our own tree and eaten with weetbix, porridge or custard. 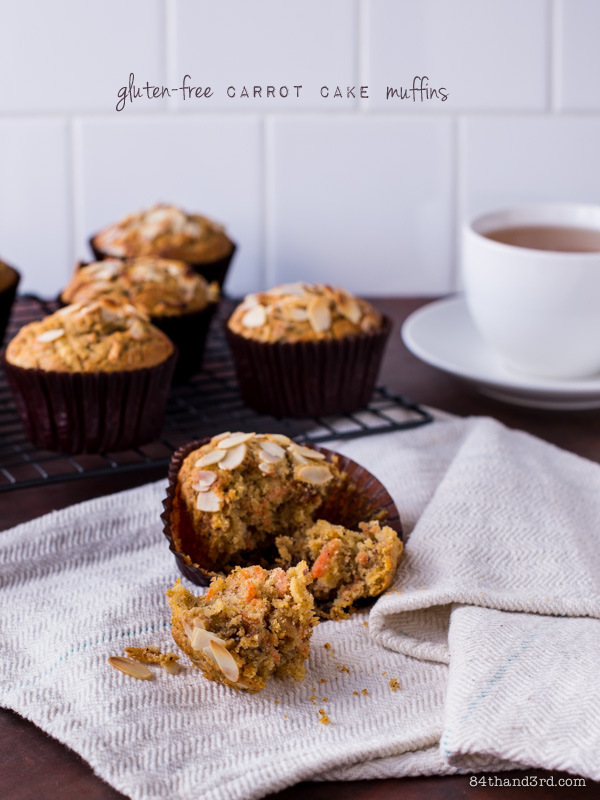 I love carrot cake, these muffins look perfect to enjoy with coffee or tea! Our family has a chocolate cake recipe which gets passed down to each new cook. It must be iced with chocolate icing and have coconut sprinkled on top. Otherwise it’s just not our cake. Growing up, my grandma made the best pecan pie for every holiday. Til this day, I still love it. I make it all the time. Mum use to make caramel slice a lot when we were little as a special treat and I still love making it today. Growing up, we always had soup. I make it a quite a bit less watery these days, but a great staple. My Dad had an amazing veggie garden and I absolutely loved the beet root he grew that my Mum would boil in sweet vinegared water. I still love beetroot, but I roast it with balsamic vinegar or honey and wholeseed mustard. Baked potato’s. Wrapped in foil and baked in the open fire, then topped with all sorts of goodies, Mum always had coleslaw, Dad and my brother opting for baked beans and eggs, where as I always stuck with butter, lot of butter, cheese, sour cream and fried bacon and onions. Spaghetti! As an adult I adapt my grandmother’s recipe for a healthier Turkey mince version and it’s still my favorite. Hmm, which delight should I choose? One of my Mum’s or Grandma’s? The first that springs to mind that I still absolutely LOVE without question – tuna patties! Such an 80’s hit, but hey everything retro is cool again. So tempted to bust these out at a dinner party, with all the trimmings. They wouldn’t be regular tuna patties, I could spruce them up adding new trend delights like finely shredded kale and sweet potato! My dad’s famous baked pork chop rice with tomato sauce. It’s delicious!!!! Wow! Great comp! I would have to say a fantastic spinach pie my Mum would make. When I moved overseas for a bit I had to get her to send me the recipe so I could make it. Still love it, my total favourite! Yorkshire pudding…..this is my family recipe that requires the use of the “family” tins…without which, the puds dont rise at all. That SMOKED COD that Mum cooked for us: stank and tasted disgusting. The negativity towards all things smoked has stuck with me since. On the other hand, puddings are still a winner, especially the chocolate self-saucing type! My memory of food- many summer evenings with the whole family (five of us) perched on various limbs of our mulberry tree eating mulberrys for desert as the sun set. We still climb that tree, when the fruit is in and we all happen to be together for dinner. My Grandma instilled in me a love of baking – she had me standing on a stool creaming butter and sugar before I could talk! Sadly, she is no longer with us, but her recipe for Sultana Cake lives on. It is sweet and dense and every mouthful reminds me of her. Sometimes I even ask my 89 year old Grandfather to make it for me! I now have my children to pass the recipe on to, and they can all cream butter and sugar together (by hand) beautifully. Chocolate afghans! My Dad loves them, and I would bake them for him from when I was around 10 years old and older. I used my grandmothers recipe. He was very specific on how they had to be (just like Gran used to make), with pink icing and half a walnut on top. I still make them for him for Father’s Day every year, and sometimes for my own children. With pink icing and a walnut of course! Traditional Sunday roast lamb lunch , all year , no matter what and no matter how hot …..!!! Always … Everybody made sure they were home for the roast … There was always lots of spuds , pumpkin ,cauliflower , parsnip , peas, beans, gravy and a large leg of lamb , and always enough leftovers for school sandwiches …. I make it the same way for my family and it’s still a favourite …. My mother’s scrumptious strawberry cake! Just thinking about the amount of sugar in the icing is giving me a tooth ache. AND I LOVE IT. For me it was not really what we were eating but the joy of all of us around the table talking ,laughing and just enjoying each others company and my Father would always compliment Mum on everything that she had put on the table for us. As kids, my cousins and I would always get a special sponge cake for birthdays. It was a special family recipe that only a few women in the family knew how to make. I was fortunate enough to learn how to make it before they all passed away and still make it today for birthdays or any ol’ occasion. When my mum and dad first got married, the only dessert mum knew how to make was Carrot Halwa. Grated carrot slow cooked in milk, sugar and ghee, then sprinkled with raisins and toasted nuts. Although her cooking repertoire grew exponentially soon after, Carrot Halwa was still a favourite which she made from time to time. It was also one of the first Indian desserts I learnt to make. Great post JJ and the book looks fabulous!